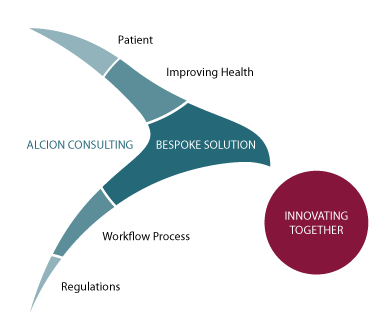 Specific and professional Alcion Consulting is striving to provide the best services possible in Regulatory Affairs and Quality Assurance for both Pharmaceutical and medical Industries. We gained a broad knowledge in Regulatory and Quality day to day extensive activity around the world. We are always on the look-out of the perfect balance between client expectations and efficient solutions within regulatory compliance. Our motivation is to improve Health for patients. The main objective is to build bespoke solutions with our clients. We continuously update our knowledge in Current Regulations for creating Quality workflow process. We provide deliverables as solutions for innovating together. Our experience during 20 years in both small and majors organisations in the Medical and Pharmaceutical Industry gain us strong expertise and knowledge with wise maturity, expectations understanding, clients needs and good balance between know-how and bespoke deliverables. We continuously improve our analytical and problem solving skills. We enhance our ability to adapt to new and multicultural environment and to apply acquired knowledge and skills sets to new situations. Technical assets are important in our field so we are constantly updating our knowledge in Scientific, Medical, Technical, Regulatory and Quality matters. We want that your needs become our concerns.